Sorry, Staten Island Ferry — you just always seem to get caught up in these things. Sony released a new trailer for “Spider-Man: Homecoming” on Tuesday, showing off new scenes of the web-head’s battles with Michael Keaton’s Vulture. And his version ain’t your grandaddy’s Vulture, who was basically a granddaddy. Spidey (Tom Holland) tries to go back to his daily routine after “Captain America: Civil War,” but is distracted by thoughts of wanting to prove himself. That’s when the film’s villain appears, threatening everyone Peter Parker loves. 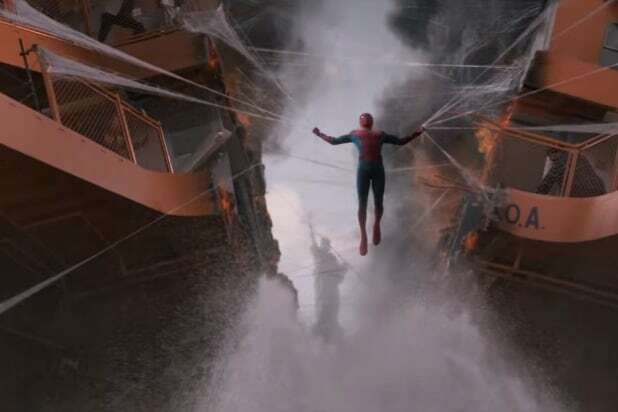 “Homecoming” will skip the backstory of how Parker gets his powers, a story that was highlighted in the previous “Spider-Man” incarnations. Earlier this week, Keaton spilled the beans on his super villain, hinting that Vulture will be different from previous villains in the sense that he is an everyman. Sony also released the first official image of Keaton in costume. Robert Downey Jr., Zendaya, Donald Glover, Jacob Batalon and Marisa Tomei also star in the film, directed by Jon Watts. “Spider-Man: Homecoming” swings into theaters on July 7.